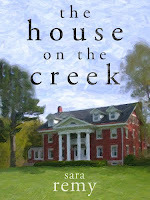 Ana Mardoll's Ramblings: Author Interview: Sarah Remy on "The House on the Creek"
Author Interview: Sarah Remy on "The House on the Creek"
Ana: Today we have Sarah Remy introducing their book, The House on the Creek. I haven't read this book myself, but Sarah was kind enough to agree to guest blog about their book to any readers who might be interested in the subject. Sarah, how would you describe your book to your prospective readers? In broad terms, what is your book about? Sarah: The House On The Creek is a contemporary romance set in Virginia. Everett Anderson has returned home after more than a decade away from his family estate. Abby Ross has spent the last year renovating the same estate, turning the dilapidated Anderson mansion into a show piece. Everett and Abby shared a childhood rife difficulties and ripe with first love. Now adults, their paths cross again and sparks fly. Sarah: The House On The Creek is really about history. The shady history of the house, the innate sense of history suffusing colonial Virginia, and of course the over arcing romantic history that Abby and Everett can't ignore. It's also, quite simply, a story about putting the past in order. I think every reader will come away with a sense of optimism. There are some hurdles in our past that seem too difficult to overcome. But difficult doesn't mean impossible. Of course, the book is a romance, so I also hope my readers come away a little heated and and a lot entertained. Sarah: I write because sometimes it's more fun to live in my own head than in the outside world. It's what I do to relax. The House On The Creek was really born some fifteen years ago, when I lived and worked in Colonial Williamsburg, VA. I loved the town, the people, the deep green James River, and the historic homes. I'm a West Coaster who fell in love with the South. When I make boatloads of money - by playing the lottery - I'd like to retire somewhere along the James. Sarah: I read a ton of science fiction, fantasy, and romance. Romance wise, I cut my teeth on Nora Roberts. Nowadays I read Patricia Briggs and Kim Harrison, also Julia Quinn, and many others. Sarah: I've published a couple of small press science fiction novels, the first when I was straight out of college. At the moment I'm half way through a young adult fantasy for my twelve year old daughter. I'm also busy jotting down notes for the next story in the James Creek series. Sarah: The House On Creek is available exclusively as a Kindle ebook at the moment. In the fall it will be more widely distributed. Anyone can reach me at madisonplacepress@gmail.com. I also have a mostly neglected blog at Wordpress. I'd really rather write fiction than blog real life. Sarah: You can find a nice preview here. Enjoy! And, when YOU win the lottery, take some time to visit colonial Virginia. You won't regret it.